Know your Life one morsel at a time. 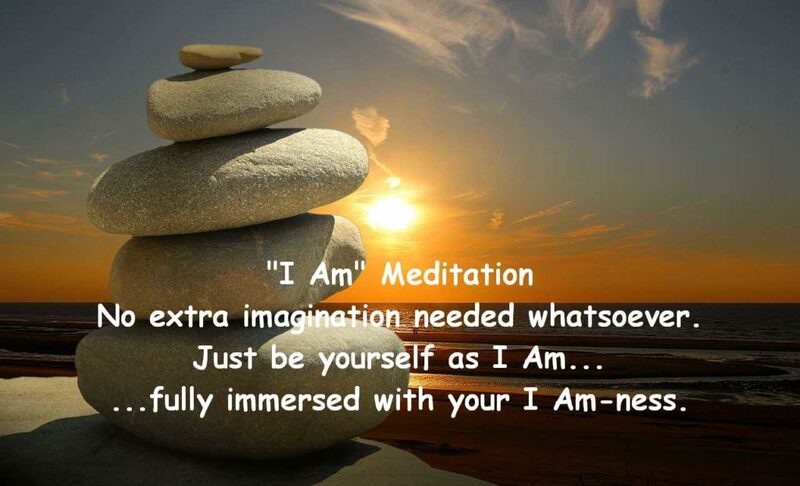 This is a simple meditation you can practice using “I Am” affirmation. It involves no intense visualization, no chanting or singing of Sanskrit words, and above all, no need to hibernate in the Himalayan cave. Yes, you can do this meditation anywhere and anytime. You don’t even have to call it meditation. Probably, “mindfulness” would suffice if you need to label it. Or better yet, Self-Awareness. Mindfulness is not a new thing. It’s been practiced by many spiritual groups. You could be mindful of your thoughts, emotions, surroundings or whatever you are doing right now. Mindfulness is the antidote for wandering mind. As always, when in the state of mindfulness, your mind doesn’t ruminate over past or future moments but fully anchored to what is in the Now — the present moment. Mindfulness is the key to Self-awareness. To understand this simple meditation using “I Am”, you need to grasp the twilight zone of Self-Awareness. As you may know, a lot of us dwell in the frantic and chaotic lifestyle, where our mind is constantly bombarded left and right. If you are one of these individuals who are fully engaged in mundane affairs, it’s time to decelerate and stop. Take a breath. Be mindful of yourself and stay in the state of Self-Awareness. You are here, right now. You feel the in-and-out of your breath and the wholeness of your body, from head to your chest and all the way to your feet. But you recognize you are not your body because you animate it. You are within and beyond your body. Without you, it’s lifeless. Then you observe your thoughts and emotions, leaping from concept to concept. But you know you are not your thoughts or your emotions. They come and go, yet you are still here. So you simply watch them as they slowly vanish into nothingness. Finally, what’s left is YOU — the only real subject you can attest with absolute certainty. You are 101% sure you exist and bear witness to your existence. Thus you are aware of yourself. And you are here, right now, in Self-Awareness. While you are in the mode of Self-Awareness, fully aware of yourself, you can now affirm who you are — I Am. You don’t need to focus your attention to God, Light, or any Deity. You don’t have to imagine yourself as spirit engulfed with spiritual aura. No extra imagination needed whatsoever. Just be yourself as I Am, fully immersed with your I Am-ness. When you cultivate this simple meditation daily, you become accustomed with Self-Awareness. And the feeling of I Am-ness will be spontaneous and automatic. That’s why, as I mentioned above, you don’t need intense visualization. The feeling of yourself as I Am is enough. In fact, it’s your natural state of awareness. So wherever you are and whatever you do, you can do self-awareness and internally affirm — I Am. Obviously, the steps are quite simple. Mindfulness of yourself or Self-Awareness, then affirm “I Am” and feel your I Am-ness. Now, you might be wondering, what’s the end result of this? Good life? Success? Salvation? Enlightenment? What is to gain if the I Am-ness is your natural state? You are already that. This simple meditation is just to remind you that you are the only real, and the rest are merely imagination. In fact, everything is illusion but You. So you are not this or that. You are I Am. Indeed, I Am That I Am! Do you believe in Karma? Whether, it’s yes or no… better do the right thing! Memes with Powerful Words of Wisdom that could help to Change your Life.